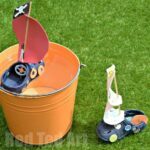 Ask the kids get bigger, they become more demanding.. they wanted a MOVING self propelled Boat Craft. Yep a self propelled one. 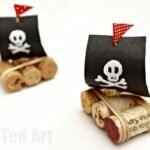 Making self propelled “things” I think are great fun for kids and very exciting indeed. So we had a go. 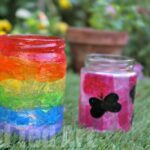 Using old margarine tubs, a yogurt pot and some craft sticks…. 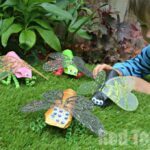 Pop over to Life At The Zoo to discuss the Science element of this craft! 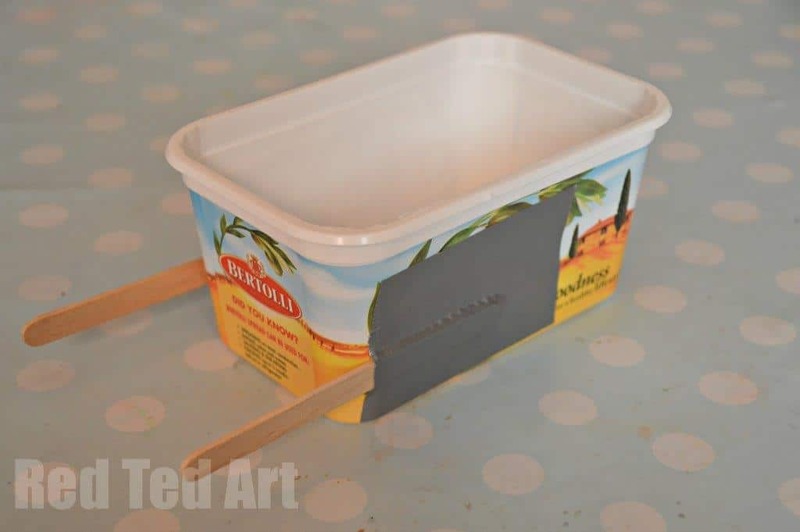 1) The first challenge is to secure your craft sticks to the side of your margarine tub. PVA glue is actually very good, but often not that water resistant. A hot glue gun, can’t grip the surface of the tub very well and may come off. So I opted for superglue, which is also not ideal, as wood absorbs the glue. But it worked well enough. I did the superglue-ing over night, so the kids were well away from it all. And then I secured it with some strong duct tape. I repeated the same for the yoghurt pot stuck down on the lid – a little bit of superglue and then some duct tape to secure it. 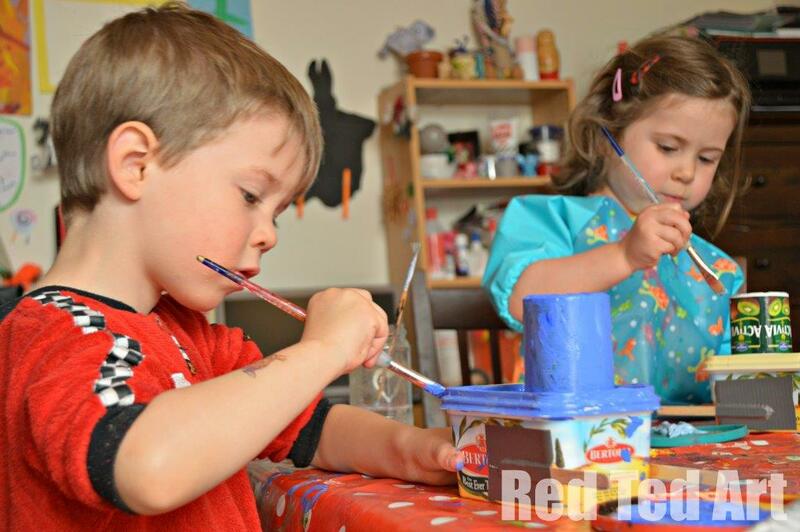 2) The kids then painted the boats in chosen colours. I was amazed that for once, Pip Squeak did NOT choose pink (though it was a close call). 3) Once dry the kids chose some tape as decoration and I added some windows for them. They did have the choice to do the windows, but they wanted me to do them. 4) Then cut a piece of plastic from your extra lid for the paddle. 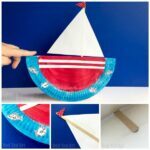 Make it fit the width of your craft, but not too wide, so that it gets stuck as it goes round. You may want to trim it. Cut slits through and then put ONE piece of the elastic through it. By trial and error we found if ONE elastic is woven through, it spins better than if you do both. 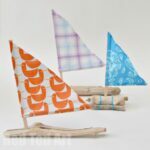 5) Wind your craft up and let it swim! Just so you know – the boats DO work. But the “wind” in the elastic means that it will probably only go about 50-100cm before it stops and needs “winding up again”. But you can experiment with different elastics (some with more tension) and sized pedals and see how well they all do! 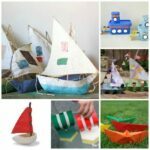 Have you made any self propelled boat crafts? Would love to hear about them! 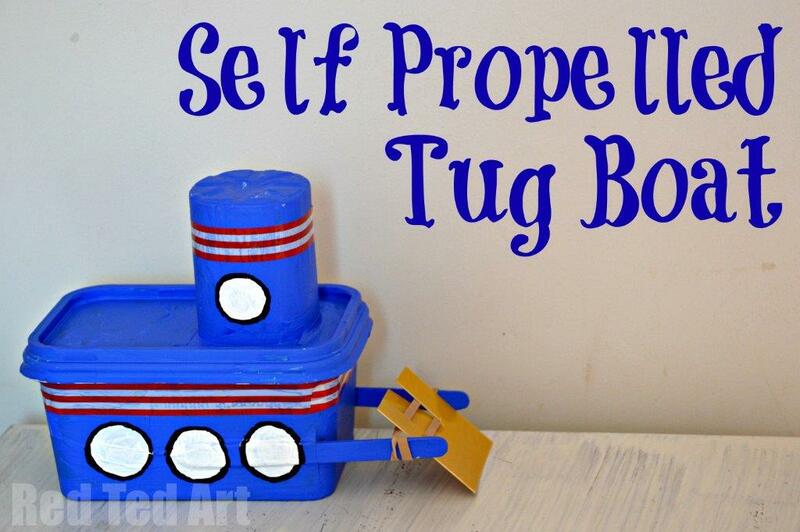 Those are adorable boats! My son would love that! Pinning this for future use! How do you think these up? I love the fact they are actually workable. 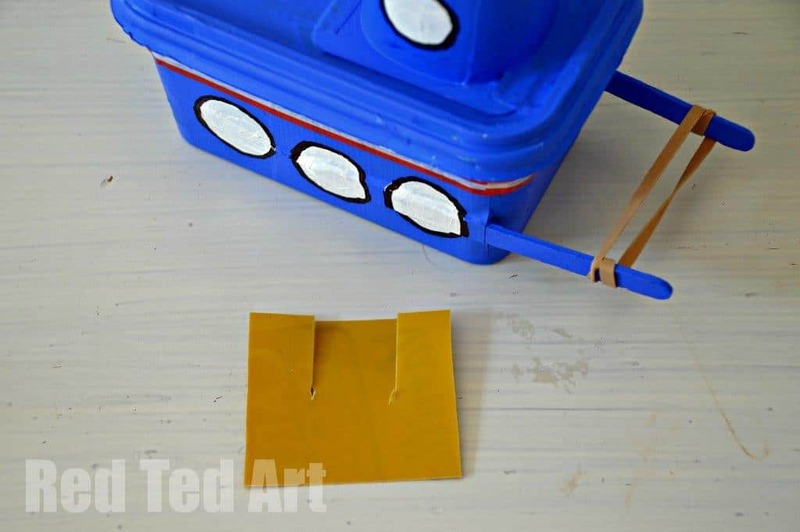 A self propelling margarine carton boat – what more could a child want?! Oh my goodness, that reminds me, I have little video to upload of it in the bath!!! What kind of paint did you use? These are awesome! Acrylics! They won’t last forever though and it does scratch a little.. but you could always touch them up a little if you need to! Another awesome creation!!! 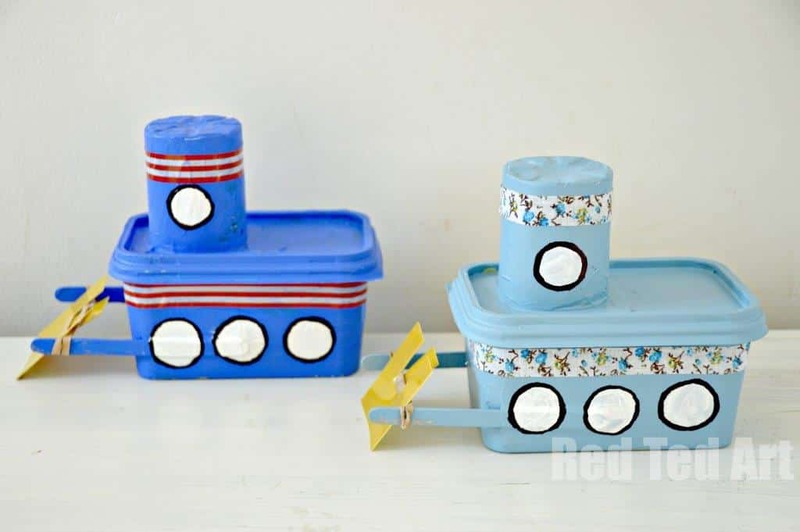 Could you Mod Podge over it to make it waterproof (for those who want it to last)??? I had a chat to a crafty friend who knows all about glues and stuff.. and she thought that Mod Podge is water based and therefore would also dissolve. I have heard mix things about the “outdoor Mod Podge”, ie not sure if that would work either? I guess you could try a waterproof varnish? Oh these are just fantastic. Another “must try” to add to our list. Thank you for a great idea. Awe thanks ladies! So many kind comments today!! YAY! Sorry to hear some idiots have attacked your site. It would be much appreciated if you didn’t refer to them as “Hackers”. Real Hackers are people that create things like WordPress (the thing you use to blog). “Vandals” is a much better name. Keep at it going please, and I hope you have covered up whatever vulnerability the vandals used. These are so cool! 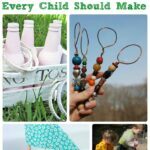 My boys would love to make them for sure. I’m featuring this on The Sunday Showcase this weekend.